Description: This volume collects essays that represent intellectual milestones that are informing sociorhetorical interpretation during the twenty-first century. The essays are arranged into five parts: (1) Topos; (2) Cultural Geography and Critical Spatiality; (3) Rhetorolects and Conceptual Blending; (4) Rhetography; and (5) Rhetorical Force. 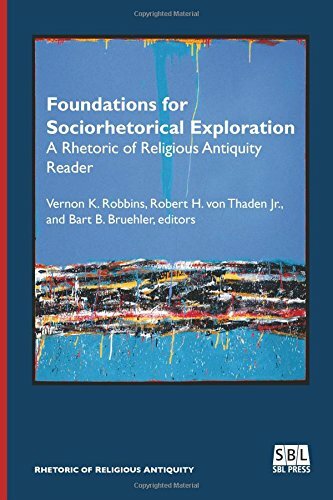 Citation: Greg Carey, review of Vernon K. Robbins, Robert H. von Thaden Jr., and Bart B. Bruehler, eds., Foundations for Sociorhetorical Exploration: A Rhetoric of Religious Antiquity Reader, Review of Biblical Literature [http://www.bookreviews.org] (2017).